T’ang died in 1991 and had lived in Paris since 1948. The French government took over his estate as an heir could not be located. Koutouzi, however, found the artist’s brother - who was living in China - a few years later. In 1995, the sibling was legally made T’ang’s only beneficiary. 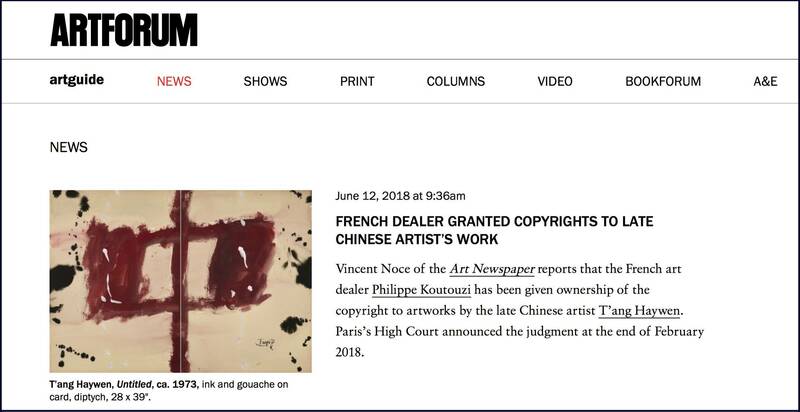 Koutouzi transferred the entirety of the artist’s estate to the brother while purchasing the copyright to T’ang’s work for the symbolic amount of one franc. Koutouzi says that, at the time, the artist’s works were nearly valueless. But in 2015, an abstraction of his from the mid-1960s sold at Sotheby’s Hong Kong for $438,590. The dealer is writing T’ang’s catalogue raisonné. He has been involved in several legal battles throughout Europe over artworks attributed to T’ang that he has claimed are counterfeits. One of Koutouzi’s main adversaries is the Paris-based dealer Enrico Navarra. Koutouzi filed a complaint in France against him for organized fraud seven years ago. Navarra claimed that Koutouzi invented the story about the heir in order to get the copyrights. A criminal investigation ensued, but nothing came of it, as evidence to back Navarra’s allegation was never found. Koutouzi says that he has been noticing T’ang fakes since 2010. The dealer claims that scientific tests have been carried out on many works to determine their authenticity. For instance, paper fibers from several works were carbon-dated by the Swiss Federal Institute of Technology in Zurich. It was found that some of the pieces were fabricated up to twenty-three years after the artist’s passing.